CANBERRA/BEIJING/TOKYO - Since the Soviet Union fell in the early 1990s, Southeast Asia has sought to avoid getting caught in a fight between major powers. The Trump administration is making that position look increasingly untenable. 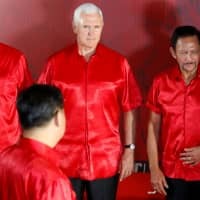 Vice President Mike Pence sharpened U.S. attacks on China during a week of summits that ended Sunday, most notably with a call for nations to avoid loans that would leave them indebted to Beijing. He said the U.S. wasn’t in a rush to end the trade war and would “not change course until China changes its ways” — a worrying prospect for a region heavily reliant on exports. The meetings in Singapore and Papua New Guinea produced little to suggest U.S. President Donald Trump and Chinese counterpart Xi Jinping would reach a deal when they meet in a few weeks at the Group of 20 summit in Argentina. The Asia-Pacific Economic Cooperation summit ended in disarray on Sunday after leaders failed to agree on a joint statement, reflecting tensions after Trump threatened to add to tariffs already in place on $250 billion worth of Chinese goods. Xi has retaliated with duties on $110 billion in U.S. imports. Smaller economies in the Asia-Pacific have long sought to balance ties, reaping the benefits of trade with China’s fast-growing economy while relying on American firepower to rein in Beijing’s assertiveness over disputed territory. Yet the trade war has raised the prospect that nations will now need to pick sides, particularly as higher U.S. tariffs threaten to alter long-established supply chains. Earlier this month, former U.S. Treasury Secretary Hank Paulson warned of an “Economic Iron Curtain” dividing the world if the U.S. and China fail to resolve strategic differences. That could lead both sides to deny each other technology, capital and investment, reversing decades of gains from globalization. For the moment, that day still looks a ways off. Papua New Guinea, an economy smaller than all 50 U.S. states that hosted the APEC summit, signed deals in excess of $1 billion with both China and a U.S.-led bloc. While the U.S. can depend on allies like Japan, Australia and Taiwan, nations such as South Korea and the Philippines that have defense arrangements with the U.S. would try to hedge, according to Minxin Pei, a China scholar and specialist in U.S.-Asia relations. While in Asia, Pence said the U.S. provides “a better option” for nations in the region and announced a plan along with key Pacific allies to build a $1.7 billion electricity grid in Papua New Guinea. The U.S. also joined with Australia to redevelop a naval base, and held a meeting of “the Quad” — a grouping that also includes India and Japan — in a bid to balance China’s rising economic and military strength. After APEC, Xi is due to visit Brunei and the Philippines, a U.S. ally that has moved closer to China under Rodrigo Duterte. Xi also recently hosted Shinzo Abe in the first bilateral visit by a Japanese leader to Beijing in seven years. 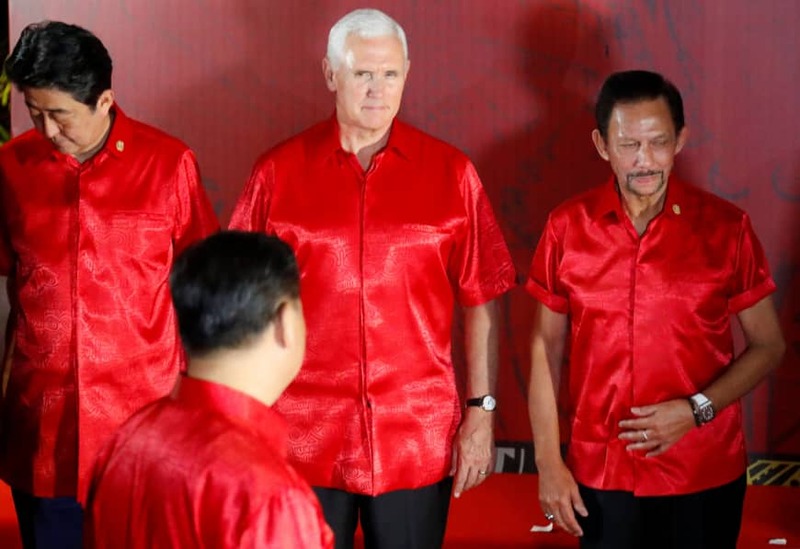 Pence sought to downplay regional concerns that American actions would lead to economic pain and force countries to choose between the U.S. and China.